Its Cooking Dash meets Hell’s Kitchen! The newest fast-paced time management game gets more challenging, because this time Flo will show her gastronomic skills on live TV. You will help her prepare dishes and serve some of the most delicious menu items to impatient customers. And If you are bored helping Flo, then why not lend a helping hand to Gordon Ramsay? The faster you serve food to your customers, the more coins you earn. Many times, customers give bonus seconds, which boosts the timer. However, losing customers may earn you a penalty. Serve impatient, angry customers first i.e. those customers whose waiting meter is lower than others. The green meter beside each customer is his/her waiting meter. A customer will leave Flo’s show if the meter goes below the danger level (red). Once the meter goes down and turns orange, it signals danger and the customer will show signs of restlessness and anger. Some angry customers give bonus coins, so you are not at a loss if you are a bit late in serving them. Just make sure the waiting meter doesn’t turn red. You may ignore such customers for a few seconds to focus on those who order an entrée with side, because in the latter case, you will need to prepare both entrée and side and only then you can serve them to a customer. For entrée with coffee order, you can keep a customer happy for a few seconds by serving him/her coffee first. You can come back later and serve them the remaining dish. If there are three customers and the first customer has ordered a dish with coffee, focus on preparing dishes for the other two and serve them. When the waiting meter of the coffee customer dips down, serve him coffee first. This will increase this waiting meter. You may again focus on new customers. Finally serve him/her the dish they had ordered .You can follow this trick for dishes that can be served separately to a customer. All levels are timer-based and so Flo needs to be quick in serving impatient customers. The good news is that she can use both hands to hold dishes/ingredients. Take advantage of her multitasking ability to cook and serve dishes faster and save time. You can use this tip for entrée + side orders or those orders that require both dishes served at once. Make sure you upgrade appliances like the grill and the fryer to increase their capacity. This way you can grill/fry more than one menu item at a time. Remember that you need only one star to complete the current level and get to the next level. Before preparing dishes, take a look at the number of customers you will be serving. The number can be seen at the top left corner of the screen. You don’t have to serve all customers, but need to earn coins from them to collect a star. 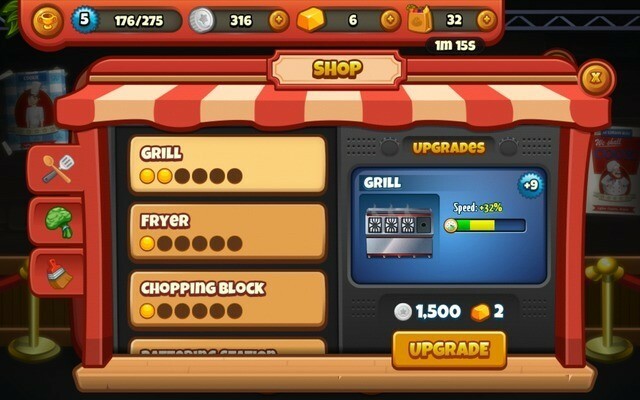 Upgrade food items and ingredients to earn extra coins. The more customers you serve, the more coins you will earn. A customer will tip once he/she eats food. Make sure you tap on coins soon after they leave to make way for new customers. A new customer won’t appear on the table if you don’t collect coins. You have only few minutes to serve customers and need to earn coins within those minutes. Grab those coins immediately to let a new customer enter your show and take his/her order immediately. You should upgrade food items first if you want customers to tip heavily. Upgrading food items improves their quality of the menu item. Serving quality dishes will definitely attract generous tips. The more coins you earn, the faster you will reach a star. A dish prepared with upgraded food items also increases bonus tip. In Cooking Dash 2016, upgrading kitchen appliances like Grill and Fryer will increase their capacity and burn time. A grill or a fryer with additional slots will let Flo fry or grill more than one food items. 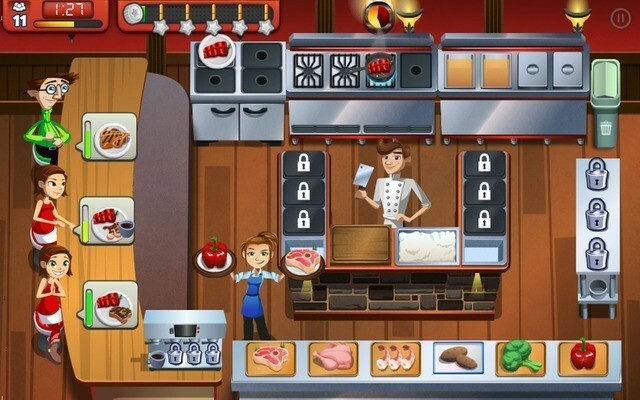 This in turn will cook food faster; you will serve customers faster than usual and earn bonus coins. Increased burn time will ensure food items don’t get burned quickly. You should also consider upgrading the warming station to increase its capacity. This appliance can be useful for entree with side dishes. You can keep one or two dishes on the warming station for future use or when you to combine with another dish straight off a grill or fryer. Upgrading the Chopping Block and Battering Station will increase speed. Chopping and battering takes time and you need to be quick to serve customers. A speed upgrade will make battering and chopping faster. You can replay previous season levels any time to earn extra coins. Look for previous levels where you earned only 3-4 stars and try to earn five stars in your second attempt. You earn a 5 star bonus and more coins/XP points if you get all 5 stars in a level. Start with those levels where you were just one star away from getting a 5-star bonus. Then replay those levels where you received only 3 stars. This is one sure-shot way to earn coins + bonus rewards. Too tired helping Flo in this fast-paced cooking Sim game? Take a break and check out our World Chef guide, a slow-paced cooking sim game. It lets you build your own restaurant empire, but there isn’t any hurry to serve customers. 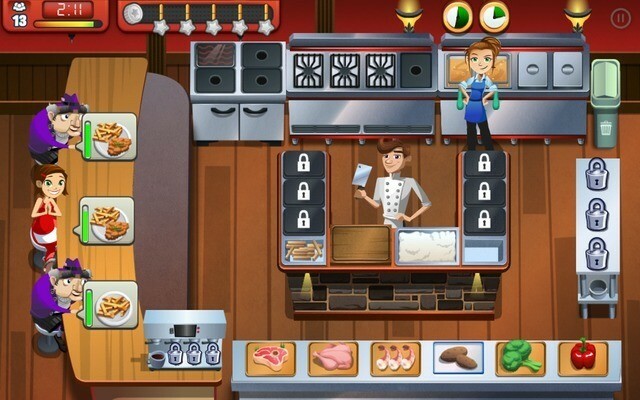 There are plenty of fun-loving chefs to be unlocked and a unique player’s marketplace where you can buy and sell dishes and ingredients. Look for trophy notifications at the top-left corner of the screen. You earn a trophy and some rewards after completing the required tasks. The task could be anything ranging from beating episodes to serving customers. There are plenty of trophies and rewards to earn so keep playing levels. You get profits from previous season every day. You will need to complete a season first before you can earn coins daily.